Dave Rawlings won a �1,000 qualifier at Rookery Waters. The Fish ‘O’ Mania Final at Cudmore Fishery in Staffordshire turned out to be a damp squib as far as spectators were concerned. The two local rods taking part in the main event, Josh Pace and Steve Freeman, started okay, but saw their chances fade quickly late on. 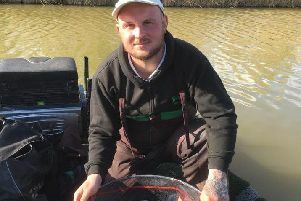 By then the big fish had all but gone from the lake and been replaced by smaller fish giving those chasing eventual winner Jamie Hughes no chance of a late surge by taking a gamble and fishing positively in the margins. So the once in a lifetime opportunity to win £30k has passed for two local men, although there were successes in the ladies and junior events. Abbie Kendal from Benwick took part in the ladies final and finished a creditable third after looking the likely winner for much of the match. And in the junior event young Tom Edwards from Bourne finished £1k richer after catching the biggest fish of the day. You whould watch out for Tom as it’s not only me predicting a glittering future. He is already a force to be reckoned with on the Open scene and he’s only going to get better. North View small match lake at Gedney Hill was the venue for the Deeping St James club match which saw Alan Jopling drawn on fancied peg 14 in the second round of the South Holland League match. Fishing banded pellet with the feeder tight to the side of the island, Jopling caught carp throughout the match to finish with 118lb 15oz. In second place on peg 18 was Roy Torrington with 94lb 12oz and third on peg 13 was Andy Wilson with 80lb 1oz. Kings Ripon-based angler Dave Rawlings was a clear winner in the Saturday £1k qualifier open at Rookery Waters fished on the Jay Lake. It was Dave’s first attempt at qualifying and he made no mistake catching consistently on a short pole line with meat and later on a top two tight in down his left-hand margin for 146lb 8oz. Second place went to Mark Cross on 124lb 8oz followed by Tony Dawson on 115lb 80z. The Thursday qualifier again on the Jay Lake saw Kevin Peacock topping a small, but strong field with 154lb, then came March rod Barry Mason with 147lb 10oz and Andy Leathers with 136lb. Kingsland Small Carp Lake is fast becoming one of the top venues in the area and in the latest Whittlesey AA match some very good weights were again taken topped by Andy Bull with 141lb 2oz. He caught shallow fishing at four metres on single maggot over hemp and castor and in the margin for the last two hours on a bunch of maggots over hemp and corn. Runner-up was Andy Lawrence on 119lb 140z and John Hudson was third with 102lb 12oz.